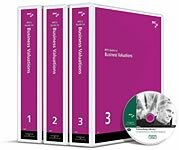 Jim Hitchner's Valuation Products and Services (VPS) offers a variety of resources for business valuation practitioners and litigation consultants. While those resources are highlighted below, please visit www.valuationproducts.com for further information or to place an order. Jim Hitchner's bi-monthly journal, delivered in electronic or print format, is an indispensible resource for the valuation and litigation services practitioner. Its Panel of Experts, made up of over 40 industry leaders, contribute timely, concise articles that focus on practical application of business valuation and litigation services models and tools. No nonsense. No bias. No agenda. This ongoing series of webinars focuses on current topics presented by industry experts. In keeping with Hitchner's hallmark style, information is presented in a practical, easy-to-understand format. Future webinars are just $219 per firm; registered participants from only that firm receive 2 CPE credits at no extra cost. Past webinars are available for download or on CD-rom. Eliminate your fears and save time and money with a series of checklists and sample customizable reports that will help to ensure you are in compliance with the AICPA, ASA, IBA, NACVA and USPAP standards. This interactive Question and Answer is delivered electronically to your inbox at NO charge. You can submit your question to jhitchner@valuationproducts.com and see it answered in a future issue. To sign up to receive the Q&A, click below.